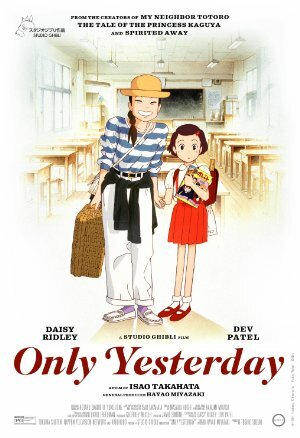 I saw the subtitled version of Only Yesterday on its recent US theatrical run. It blew me away. At the end of the film, as the credits rolled, I had this moment when all the images, emotions, and characters from all the different episodic memories suddenly meshed together into something much greater than the sum of its parts, and totally bowled me over. I started weeping right there in the theater, harder than I ever have at a movie. It really touched me in this deep, ineffable way. A few weeks later I was reading about the Japanese concept of "mono no aware", which translates literally to "the pathos of things." It's a certain strong, sudden sensitivity to the passing of time, and a gentle melancholy that all things are in the process of passing. Only Yesterday is powered by this feeling, and I think that's why it hit me with such force. Only Yesterday is a God-damned masterpiece and my favorite Studio Ghibli movie. The ending sequence never fails to completely unmake me. The ending sequence never fails to completely unmake me. I have never, ever, ever not started welling up the moment Taeko's classmates and young!Taeko pop up out of the empty train seats in the ending. It's one of the movie moments that makes me lose it completely, and it's not even sad -- but that may be why: it's a rare moment of Cosmic Correctness, in which the only thing that ought to happen, does.